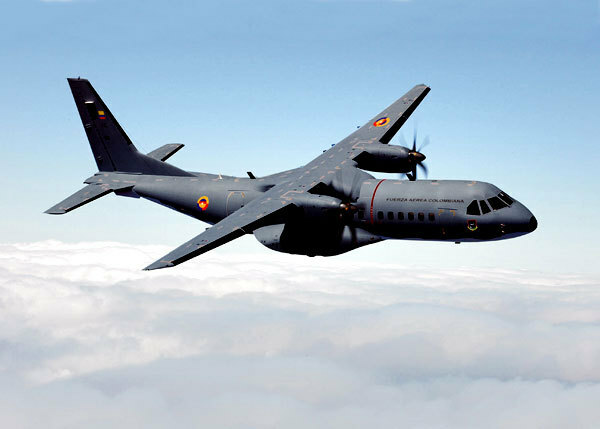 The attached photograph shows a previously delivered C295 of the Colombian Air Force. The new generation C295 is the ideal aircraft for defence and civic mission to the benefit of society, such as humanitarian actions, maritime patrol, and environmental surveillance missions, amongst others. Thanks to its robustness and reliability, and with simple systems, this medium sized tactical airlifter provides wide versatility and flexibility, necessary for personnel, troop and bulky/palletized cargo transportation, casualty evacuation, communication and logistic duties or certified air-dropping capabilities. Its mix of dual technology civil/military equipment ensure success on demanding tactical mission, growth potential for future equipment as well as compatibility with the latest civil airspace environment. The C295 is part of Airbus Military’s family of light and medium airlifters which also include the smaller C212 and CN235 platforms.